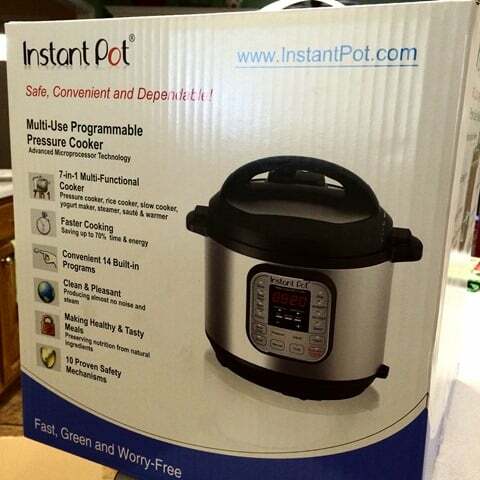 This post is on behalf of InstantPot. All opinions are my own. What once was old is new again. This applies to so many things in the cooking, fitness, and fashion world. Don’t believe me? Do you see leg warmers making a comeback? No? Check out “boot sleeves” on Pinterest. Go ahead. I’ll wait. In the cooking world, it’s time to usher in a new generation of pressure cookers. I’ve been cooking long enough that I have a great mix of fear and awe of pressure cookers. I use a stovetop one at least once a week, sometimes twice and usually for only frozen vegetables. I have never cooked a big piece of meat or “baked” potatoes. I stick to mostly frozen peas, beans, or greens to quickly turn a 1.5 hour job into about 20 minutes. However..there are some problems. Old school pressure cookers can be very dangerous. You have to make sure the seal rims are lubricated, the holes are dry, and the lid connection is sealed. Any mistakes and the thing will blow up. In fact, people have used pressure cookers for devious means other than cooking a pot of peas. My old pressure cooker was very high maintenance. I had to babysit the thing more than I should. Once the pressure built, I had to constantly tweak the stove so the gentle rocking of the regulator doesn’t build to a furious pitching. Once the food is cooked, there was the danger of running cold water over the entire pot to bring down the pressure quickly. Otherwise, yanking off the regulator will result in a burned ceiling….or so I’ve heard. These two reasons are what sent me digging a little deeper to see what else was out there. 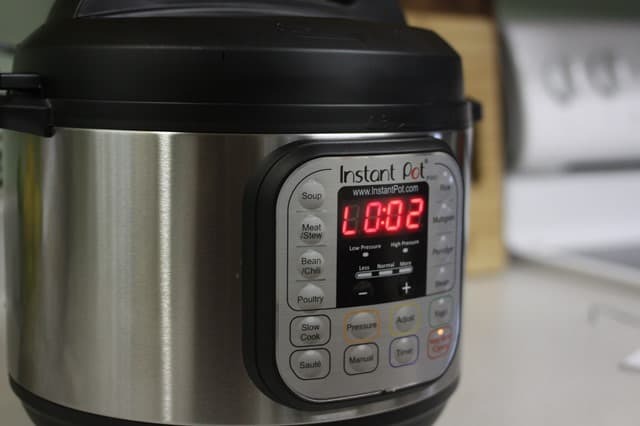 I saw the Instant Pot on a few Paleo cooking sites and I was shocked at how easy-to-operate they appeared. A few weeks later, this arrived at my door. It is an electric pressure cooker. You put food inside. You read the directions (first..do this first). You push buttons and walk away. I was floored by how easy this seemed to work. But I had to put it into action. The first thing I tried was a whole chicken. I put in my chicken with 2 cups of water. I added salt and other herbs and chopped onions and celery. 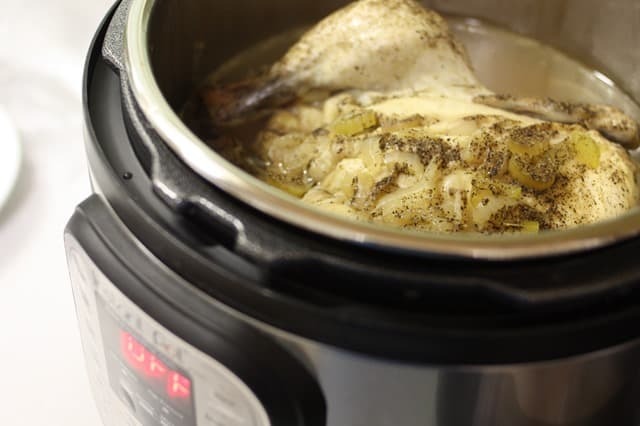 I read the directions on how long to set the Instant Pot for a whole chicken and pushed all the buttons and let it do what it was supposed to do. This is what happened when I took off the lid after the pressure released naturally. It was PERFECT! I deboned the chicken and froze the bones for making broth later. I couldn’t believe how easy this was to use. Let me go over a few things I love about it. 1. No regulator. I don’t have to wait for pressure to build, adjust the heat, adjust again, keep adjusting, etc. I just set it and walk away. 2. Pressure release valve that doesn’t burn my ceiling. The pressure valve can be turned to VENT to release the steam instantly and SAFELY. Or the valve can be set to pressure and it will release on its own. 3. So many options. This is a 7-in-1 machine. 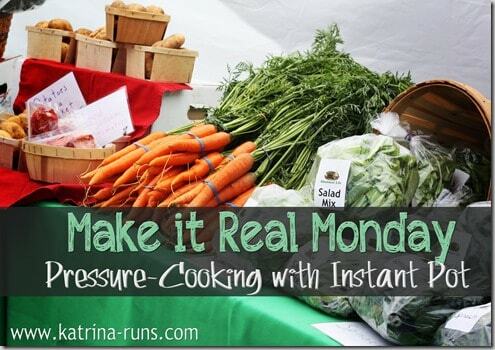 It can be used a pressure cooker, slow cooker, yogurt maker, rice cooker, saute’/brown, steamer, and warmer. 4. It can cook real food real fast. This can put an end to the excuses that creep in on busy weeknights with that “nothing to cook” mentality. 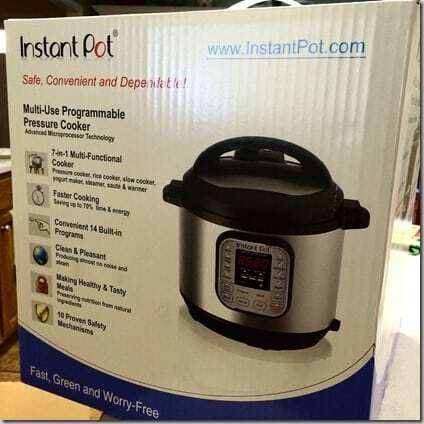 Over the next few weeks, I will be trying the different settings and sharing recipes using the Instant Pot. If you have never used a pressure cooker, or do not like using a stove top pressure cooker, this might be something to check out.